All my team training is one on one. I do not conduct large class situations outside of workshops or seminars. 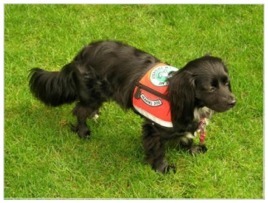 Occasionally handler teams want to meet with another to practice distractions, but typically training is one on one. Because each team is unique, much more is accomplished in a specific team environment rather than one with multiple teams with varied requirements. Check on the list below to see what is offered and a bit about how it works. Please feel free to ask questions if you require more specific information. Service dogs can also have fun!